Sidi Larbi Cherkaoui is a busy man. These days, when he's not directing Royal Ballet of Flanders or his contemporary company Eastman, he's working on a new duet with Irish dancer Colin Dunne, creating a premiere for the Göteborg Opera, or choreographing on Beyoncé like it's NBD. Next week, he's also taking a trip to New York City to perform in Sutra, his hit collaboration with a group of 20 Shaolin monks. In the 10 years since its premiere, the work has been performed in 60 cities across 28 countries to rave reviews and sold-out audiences. The New York performances at the White Light Festival mark a homecoming to the same festival where the piece received its US premiere. We recently caught up with Cherkaoui to hear his thoughts on performing on the opening night of the run, what he's learned from the monks and how he manages to juggle so many projects at once. Although most of the monks have had to leave the show to take on other responsibilities in the Shaolin temple—and the original child monk had to be replaced because, well, he is no longer a child—four of the original cast members still perform the piece today. "There's something timeless about the performance," says Cherkaoui. 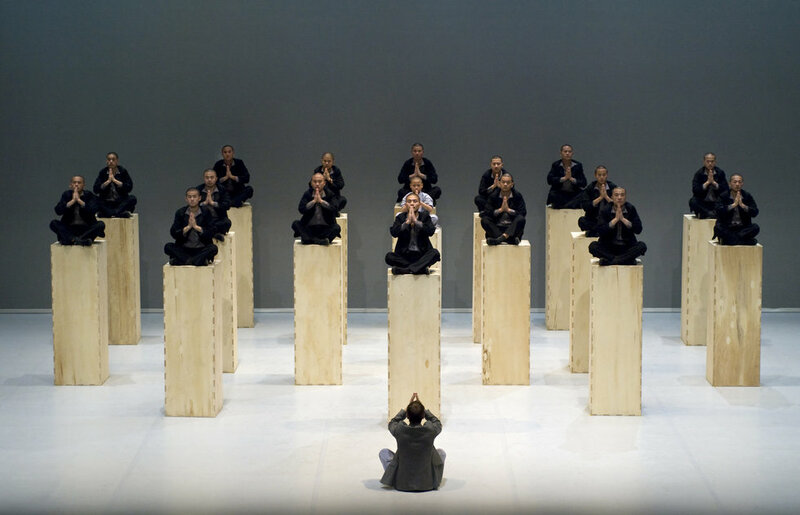 The work's themes about the isolation and loneliness of being a foreigner in a foreign land still feel as relevant today as they did when he premiered the piece in 2008—if not moreso given contemporary issues surrounding refugees and immigrants. For Cherkaoui, returning to perform in it again feels completely natural: "It's so familiar, it's like calling my mother." Cherkoui's been consistently inspired by how, as martial artists, the monks perform so authentically. "There's such power in how they approach the elements, a heightened level of authenticity," he says. "Energetically, they are extremely explosive, really direct. I love the way they push through their feet and fly straight up. As a dancer, as a human being, it's exciting to see close up how they approach movement." During his time researching Sutra at their temple, he was amazed by the way all the monks of different ages related to each other. "Usually you're mainly surrounded by your own generation," he points out. But at the temple they all worked with and took care of one another. "The temple is a tough place. It's cold. You have to be strong to get up at four in the morning, do your training, your prayer, then work all day. But there's also a lot of happiness. And a lot of jokes." Cherkaoui first collaborated with Beyoncé when he was asked to create something on her for a benefit concert for Tidal, the streaming music site co-owned by Jay-Z. That led to his working with her on the Grammy Awards, and then for her latest music video. "I believe in her message, I believe in her way of delving into highly personal things," says Cherkaoui. "I love how she understands her role in society as a pop artist." Ask Cherkaoui about his secret to doing so many different things at once, and he just shrugs it off: "Other people take care of their kids and at the same time work and go and do other things, too. I'm like anybody else, I just do my best," he says. "I'm quite structured in my whole life and I dedicate everything to the projects that I care about." And what about rest and relaxation? "People laugh at how zen I stay in the studio. I try to relax while I'm working instead of relaxing after I'm working."